This lab spinning machine is used to test and study the spinning properties of PE, PP, PA, PET, PPS, PVDF and other polymers. It can be used for LOY, POY and FDY to simulate all possible forms of filament production. 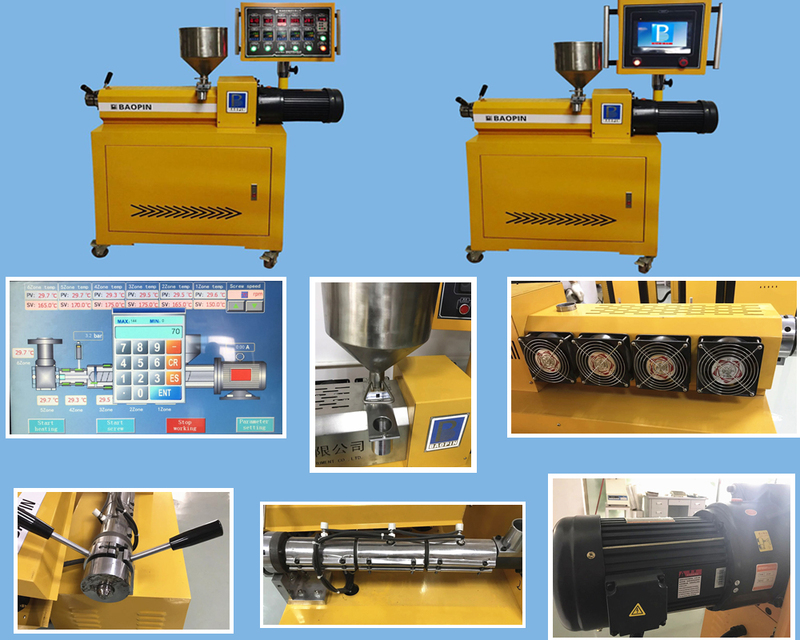 The typical application of this small spinning machine is as followed: optimized and color matching, Development of pigments, Fiber development, Small sample production and more in-depth testing. ■ Screw diameter are 20, 25, 30 (optional). Length ratio is 10 to 30 times are optional. So it expands the scope of various materials processing. ■ Screw and barrel are made of 38CrMoAl chromium-molybdenum steel. With the surface-layer processing of tempering, nitriding, chroming and super-precision grinding. So they are hard and wear-resistant, highly corrosion resistant. ■ Screw with a feeding zone, transportation segment, compression zone and the mixing head. It can process a variety of different materials to achieve the best dispersion effect. ■ 0-80rpm screw speed stepless frequency control in order to meet the requirements of different materials extrusion process. ■ Barrel heating using electric coil heater, easy maintenance, easy to install, 5-zone heating can be sure the temperature reaches required. Barrel adopts 3 multi-wing groups statically forced cooling fan, electric heating and wind cooling integrated layout, hedge balance of hot and cold to ensure effective constant temperature. ■ Die with fast connection clasp, quick disassembly head, easy connection to downstream equipment and test conversion quickly. ■ Options for diversion plate and the filter mask to prevent unmelted particles and impurities and increase the melt pressure as to ensure the quality of plasticizing. Looking for ideal Small Spinning Machine Manufacturer & supplier ? We have a wide selection at great prices to help you get creative. All the Benchtop Spinning Machine are quality guaranteed. We are China Origin Factory of Lab Spinning Machine. If you have any question, please feel free to contact us.